So far everything is shaping up to be very "woodsy" and midsummer night’s dreamish -- think little butterflies and acorns and fairy wings and whatnot... there's not so much pink happening. 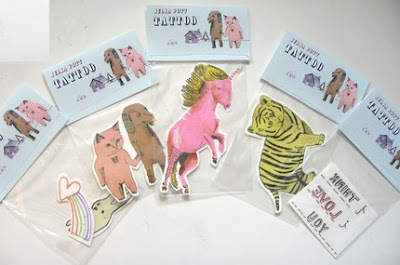 But after spotting these groovy unicorn tattoos by Julia Pott, I’m thinking I have to fit them in somewhere too…yes? My daughter is 5 and would adore these tattoos. It sounds like a very fun party. UH...YEAH! Joslyn...these would be awesome and a must for the party! those are so cool! Love them! I think you will do a great job! we have to see photos! 5! Will Finn really ever be five? ah! 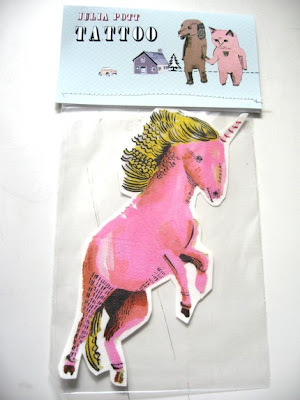 Those pink unicorns are a must-have!! Hilarious, too! these are so great! a must for sure. That sounds like an adorable idea. I really enjoy reading your blog. Man, I LOVE those!! And, what's not magical about a hot pink horse with a horn?! looove these--perfect for her party!